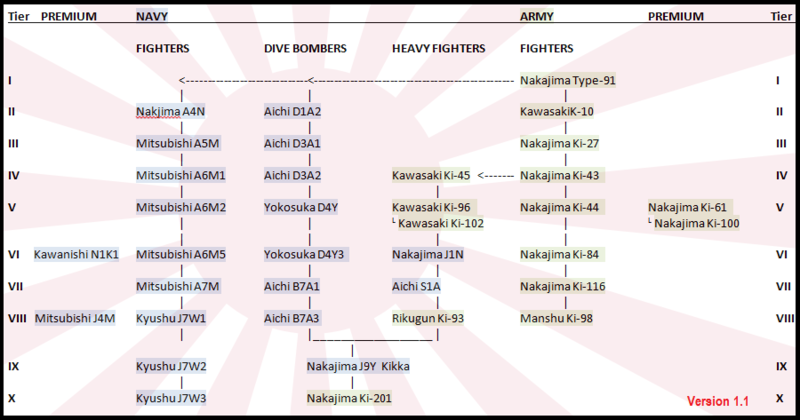 For a look at how captured Japanese aircraft might fit into the Chinese tech tree see here. * highlight colors indicate identified developmental relationships. Wikipedia links are provided above for quick information only; it is not a reliable source for making decisions. Japanese Aircraft of the Pacific War, by Rene Francillon (1970/1987 Putnam) -- extremely comprehensive, this is an excellent starting point. Fire in the Sky, by Eric M. Bergerud -- notes on Ki-43's maneuverability from the perspective of American P-40 and P-38 pilots. Thank you to Wargaming for making such a fun and addictive game; my local and state library system for making historical research possible; and thank you to the experts in this thread that provided the kind of targeted advice and enthusiasm that kept me going in the right direction. Version 4.90 -- cleaned up "dive bomber" and "torpedo bomber" lines; Kawasaki Type 92 to Tier II based on BMW VI engine in-game for Arado 65, Arado 68, Heinkel He 51; Ki-60 to Tier V to be consistent with D4Y, and to premium because Ki-61 favored for production at same tier. Version 4.87 -- Aichi M6A removed due to chronological issue. 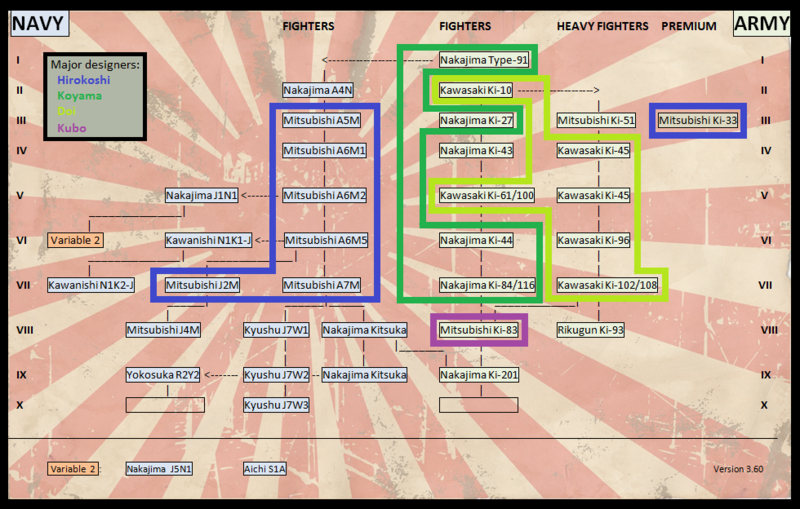 Added clarification of P1Y origin, Kikka origin, Ki-30 and K-51 placement. Version 4.86 -- Kikka context established by detailed examination of historical narrative, designer lineage, designs, engine development, manufacturing locations. Version 4.81 -- relationship and module accountability; Katsuodori, Ki-200, Ki-202 implicated via J8M removal; Fuji T1F2 continuation of native jet engine development; R2Y3 and Ki-201-II (fictional Ne-440's). Version 4.71 -- relationship accountability, module accountability, stretch of high production models; J8M removed from progression. 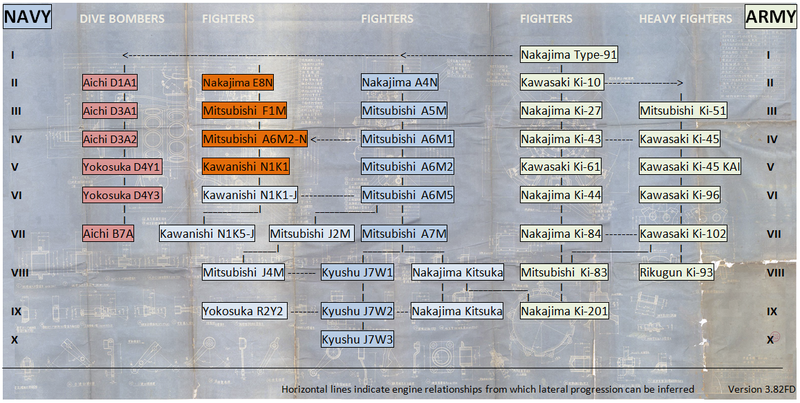 Version 4.60 -- relationships accounted for in detail; heavy fighters expounded (2-seat and single-seat). Version 4.53 -- Kayaba Katsuodori point interceptor precursor to Mitsubishi J8M. Version 4.52 -- resolved Mitsubishi J2M; affirmed Ki-44; Tachikawa Ki-94-II continuity from Kawasaki via laminar flow wings. Version 4.51 -- multirole fighters and heavy fighters by single-seat and two-seat; fictional progression; prototype saturation ~50% (proof of concept only). Version 4.48 -- multirole fighters and heavy fighters, simplified. Version 4.43 -- "multirole fighter" implications of Update 1.6; rigid layout according to class and theme (rough). Version 4.41 -- floatplane influence on fighter and dive bomber development (rough). Version 4.33 -- detailed examination of dive bombers (carrier-borne attack aircraft) and related progression. Version 4.31 -- resolved Nakajima performance at altitude; reduced complexity. Version 4.30 -- detailed examination of performance at altitude following the announcement of J4M as premium, and Japanese rockets coming soon; back to the essentials; designers. ---- missing connections via unfulfilled projects, one-off adaptations, etc. -- all propellers, and what that reveals. -- Ki-98 development mystery -- Manchuria 1938-1945 -- Discarded J4M design handed off to Mansyu engineers? Radicalization of Ki-71? -- Army vs. Navy armament (Ex: Type 89 vs. Type 97); rate of fire, velocity, etc. Edited by J311yfish, 10 November 2018 - 08:10 PM. That pic you are seeing use to be the J4M1, use to be in game. We do not know when it will return or if it will return and it was classes as a Fighter. IIRC it was the old Tier 7 in the JP line. Edited by DrSinister, 24 February 2014 - 04:47 PM. 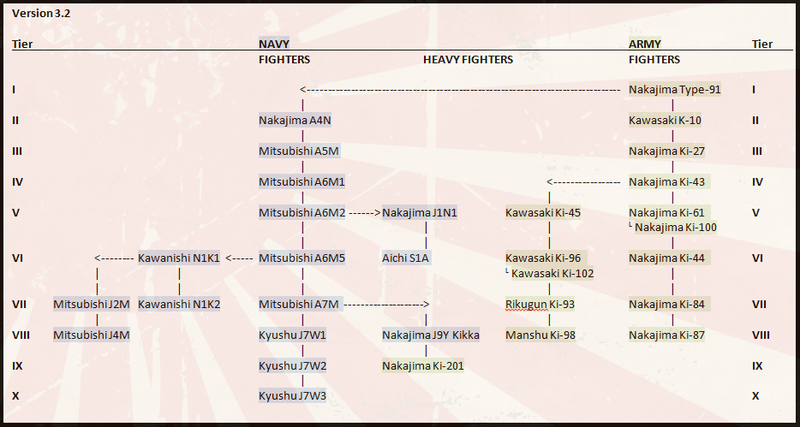 Any room for the Rikugun Ki-93 heavy fighter? It had two 20 mm cannons and a 57 mm cannon under the fuselage. Ki-93 is below. The above aircraft is a Yokosuka P1Y Ginga. I also made a suggestion about the Nakajima J1N here. Thought it could be a premium, but now I think it should be in the HF line, considering it competed against the A6M2 Zero during trials. Don't forget about the Aichi S1A Denko. Only a paper project, but this aircraft was intended to have a twin cannon turret and four forward-firing cannons (two 20 mm and two 30 mm). The two 30 mm Type 5s used by the Denko are the same upgraded cannons on the tier VIII J7W1 Shinden. Edited by Wolcott, 24 February 2014 - 05:28 PM. Thank you for the info +1. As a fan of Japanese aircraft I hope WG implement more lines. Another interesting Japanese experimental fighter was the Kayaba "Katsuodori" Ku-4 Ram Jet fighter. Premium? 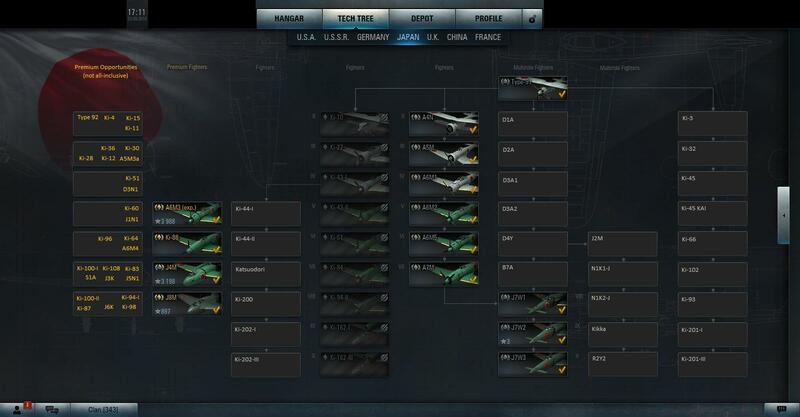 If you look at the image behind the Japanese tech tree, it shows blueprints for a twin-boom pusher-propeller aircraft that is not currently in the game. The same plane also makes an appearance on one of the loading screens (lower left corner). 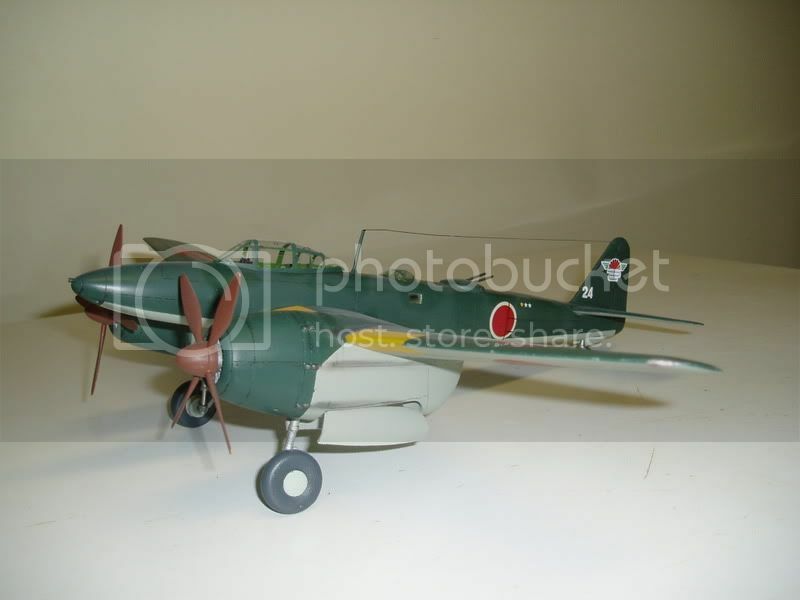 I think it is the Mansyu Ki-98 ground attack aircraft (images here, specs here). The goal was to show a chronological progression for both the Army and the Navy, as well as to acknowledge German influence (heavy fighters, jets). 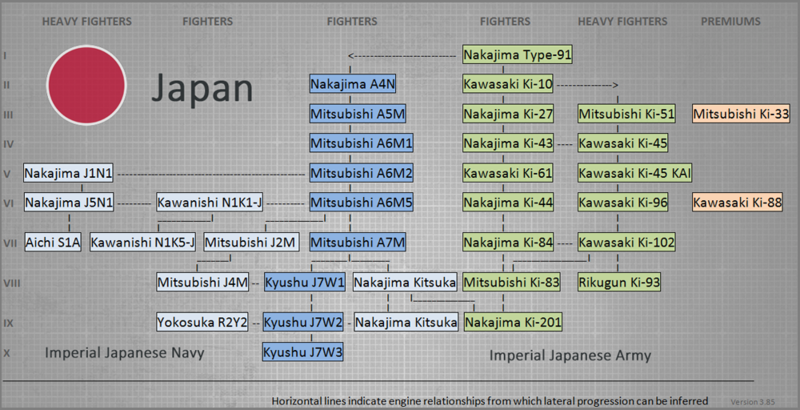 I've considered also to add other planes to the Japanese tech tree, i've made a topic in the past(i have to find it though). In any case i can simply copy/paste what i've done. Now back to the topic. 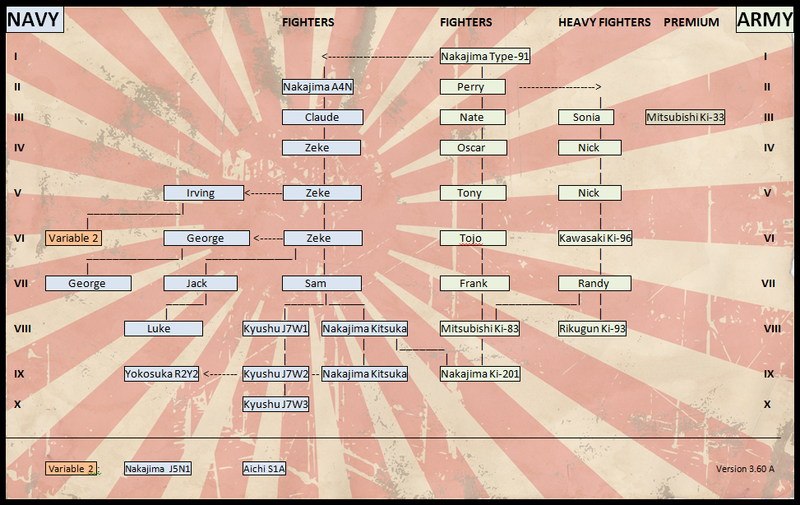 There's a problem with the tier IX and X: they are the half brothers of the 262 so they should be placed where the 262 is(Kikka tier VIII and the KI 201 at tier IX in the HF branch). It would have been easier with the 262 in the LF branch but we have to live with this. As the G4M is concerned it was a medium bomber so i don't think it will be playable, any any other medium/heavy bomber. Edited by Demon93IT, 25 February 2014 - 12:20 AM. I like to see a Attack/Bomber tree for the Navy side. If a aircraft is a torpedo bomber? Just exchange the torpedo for bombs to add more aircraft to a tree tier. Seaplanes would be fun a well. If they can land on water? A good way to break or let other planes crash in the water. To solve the Tier X problem... This could be done in two ways. 1. Give them a imported US aircraft that the Japanese used after the war. 2. Find the first Japanese aircraft that matches with a 10 tier they made after the war. They reform their air force in 1954, used F-86F Sabres and Lockheed T-33As. I have to do more research on other aircraft. 1)I'm trying not to use imported planes, that would be the last resource. 2)Japanese manufacturer essentially stopped developing their own warplanes since the end of WWII. There are some project developed immediately before the nukes but i don't know if they are viable. For example there's a rocket powered fighter, the Mizuno Shinryu. It's more of a what-if plane rather than an actual possibility, counting the fact that the Ki-200(the Japanese version of the Me-163), wasn't exactly successful. Edited by Demon93IT, 25 February 2014 - 10:31 PM. Torpedo bombers could take a role as Attack aircraft. The Devs would just have to switch to bombs and add some guns. I don't think all B5N and the B6N were gun-less. Don't forget Seaplane.... they could be useful for a low or med tier plane. Like the Aichi M6A. 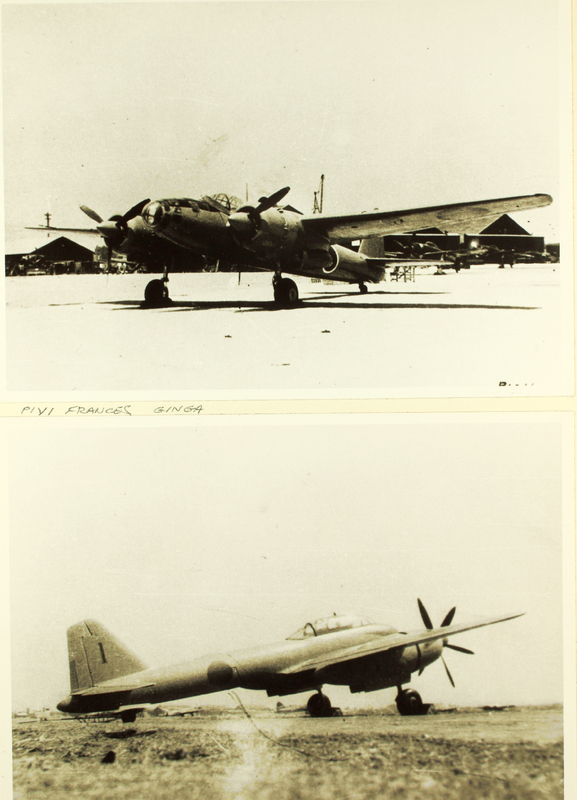 Both B5N and B6N had the possibility to mount bombs but, as i said before, they were the level bombers of the IJN carrier force(role which was covered by the G4M when land bases were available). They weren't supposed to to anything but to bomb the target and come back to the carrier, for this reason their armament was limited(less guns = less weight = better performance). It is up to the player how to use a plane. Not how it was use in real life and history. Any player can use a plane for any role and the game play shows it. Could you be more open minded? Yes, the Seiran was design for the the I-400. Doesn't mean you can't fly it at all. The Japanese flew the plane on some missions without being stationed on a sub. Seiran has a training variant with wheel landing gear than the floats. Which makes it plausible to use. No plane should be count out of it plausible. The large recon seaplane would have a less plausible being used by players. Edited by Wolcott, 26 February 2014 - 10:46 AM. True, it's up to the player how to use their planes. The problem is that they were designed to fulfill a role which isn't ground attacking and it's a common problem to every torpedo bomber. As the Seiran is concerned as Wolcott said it wasn't armed, it had only a machine gun for the gunner. If the recon plane were present as class i would have accepted its presence(as i said i really like the design), having it doing something else thanks but no. Same goes for the trainer variant, was supposed to train not to fight. The training variant wouldn't matter anyway, as the Seirans were intended to be launched from the I-400s without their floats attached when they departed for Ulithi Atoll, thereby improving the aircraft's performance. There is a chance that the Devs may add a forward armament. If not this plane? Another plane they might. Edited by Commander_Rasseru, 26 February 2014 - 11:14 AM. Well then it would become made in WG and it would require the WG tech tree(i'm not joking although it could seem so). They could say the Japanese had plans to add a armament. But, couldn't because of lack of supplies or to speed production up. This could be true. Technical Air Intelligence has to say something on this one. They were fooled by the Japanese in 1945 but, at the end, they found every Japanese project. Such modifications weren't found so, if TAI hadn't found them, it means that they never existed. But that would be fantasy and not historical. Simply following what you suggested would be twisting history. World of Warplanes Game Discussion → General Gameplay Discussion → If I remember correctly, there was a way to go from IJA line to IJN line (Shindens)?